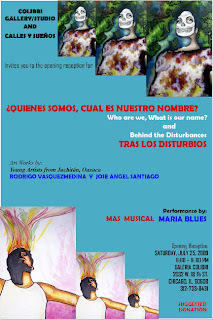 The foundation for "Calles y Sueños” was developed by several Latino artists, as a creative response to the once prevalent artistic void that existed in Chicago’s Latino arts community in the late 80’s. Its intention was to be nurtured through the change and freedom that was expressed on a multitude of levels. Culturally, the artistic community that was created by “Calles y Sueños” continues to this day cultivate its Latino roots and plant new seeds for its ever-evolving identity to continue to germinate. As the community of “Calles y Sueños” grows we continue to realize we are a transplanted people still growing in a jungle of alienation, racism and economic hardship." Exhibition by young artists Rodrigo VasquezMedina and Jose Angel Santiago from Juchitån, Oaxaca.